Packaging licensing, collection and disposal is based on national and European laws or regulations relating to all aspects of the closed substance cycle. You will find the most important legal regulations below. What is the task of a dual system? The task of a dual system is to organise the collection, sorting and recycling of used system participation obliged packaging and to document this recovery in accordance with the law. The background to this is the product responsibility of manufacturers and distributors for their packaging, as enshrined in the Packaging Act, as well as the ensuing regulation of comprehensive takeback, recovery and deposit obligations. Any company which markets (for the first time) the system participation obliged packaging must take it back free of charge and recycle it after use. For sales packaging and repackaging which is typically generated by the private end-user § 7 (1) sentence 1 Packaging Act provides for compulsory participation in an approved disposal and recycling system pursuant to § 3 (16) Packaging Act (dual system) to fulfill the legal requirements. BellandVision with its dual system BELLANDDual is recognised throughout Germany by the responsible authorities and organises in accordance with the Packaging Act the nationwide collection of used packaging for private end-users. BellandDual fulfills the packaging obligations for producers and distributors. What are the specifications for the type and scope of recovery? Which packaging is system participation obliged? Packaging is a product made of any material for the reception, protection, handling, supply or presentation of goods which may range from raw materials to processed products. It is passed on by the packaging manufacturer to the final distributor or directly to the end-user via the producer of goods / bottler and, if applicable, different distribution levels. System participation obliged packaging is sales packaging and repackaging filled with goods which, after use, is typically generated by the private end-user as waste. In addition, packaging that enables or supports the shipment of goods to the end user (shipment packaging) is sales packaging. A typical example is the shipping carton of an Internet retailer. Repackaging is packaging which contains a certain number of sales units and is typically offered to the end-user together with the sales units or serves for equipping the shelves. Which packaging "typically" is generated by private end-user and is therefore considered to be system participation obliged packaging, can in the future be looked up in the catalogue of system participation obliged packaging from the Central Agency. The catalogue is currently only available in a draft version and in German as it will be revised and re-agreed upon after the consultation process is completed. Who is system participation obliged? According to § 7 (1) sentence 1 Packaging Act, the manufacturer is responsible for system participation. The manufacturer is the distributor who, for the first time, delivers the packaging filled with goods, which is typically generated by the private end-user, to a third party engaged in commercial transactions, for a charge or free of charge. It includes distributors from stationary trade as well as mail order companies, online retailers and importers who first import the goods into German territory and are legally responsible for the import process. Under certain conditions, a final distributor is also a manufacturer of sales packaging for private label products. Who is a private end-user? Private end-users are private households and equivalent sources of waste generation according to § 3 (11) Packaging Act, which do not resell the goods in the form supplied to them. What is a so-called industry solution? 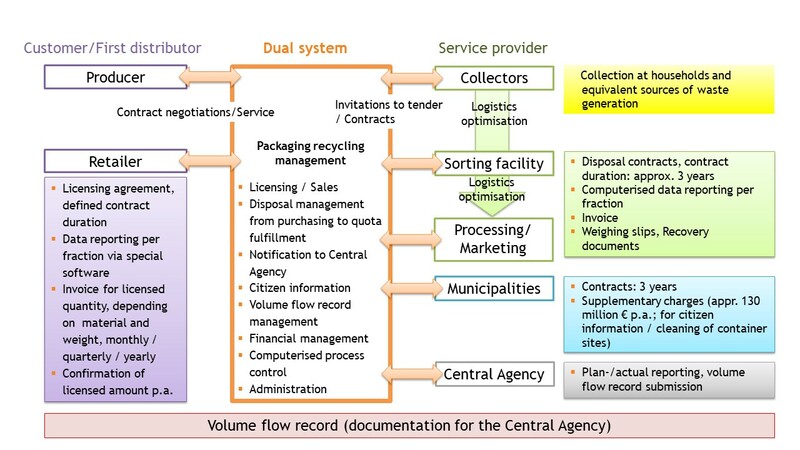 An industry solution refers to a closed system for the return and recovery of system participation obliged packaging from the equivalent sources of waste generation as in § 3 (11) sentences 2 and 3 Packaging Act. Operators of the industry solution may be one or more manufacturers or even a dual system as a third party. Pursuant to § 8 (1) sentence 2 no. 1 Packaging Act, manufacturers and distributors or third parties who operate an industry solution must provide evidence by means of an expert certificate that an appropriate industry-specific collection structure is set up at all the delivery points supplied that are integrated in an industry solution. An industry is a collective term for companies that produce largely substitutable products or services. An industry solution is thus characterized by including only a group of companies involved in the manufacture or distribution of the same or similar products and services. What is an equivalent source of waste generation? An equivalent source of waste generation in accordance with § 3 (11) sentence 2 and 3 Packaging Act is a commercial enterprise or a cultural institution. Due to the comparable disposal requirements and the generation of comparable system participation obliged packaging which is on sale in shops, equivalent sources of waste generation are equated in the Packaging Act to a private end-user. This includes e.g. restaurants, hotels, canteens, administrations, barracks, hospitals, educational institutions, charitable institutions, freelancers and typical cultural institutions such as cinemas, operas and museums and recreational areas such as resorts, amusement parks, sports stadiums and rest areas. This also includes agricultural businesses and craft businesses that have household standard collection containers for paper, cardboard, board and lightweight packaging with no more than a maximum of a 1,100-liter revolving emptying system per material fraction which can be collected in the usual household discharge cycle. The Completeness Statement (CS) is intended to ensure that manufacturers and distributors comply fully and correctly with their obligation to participate in the system according to § 7 (1) Packaging Act. 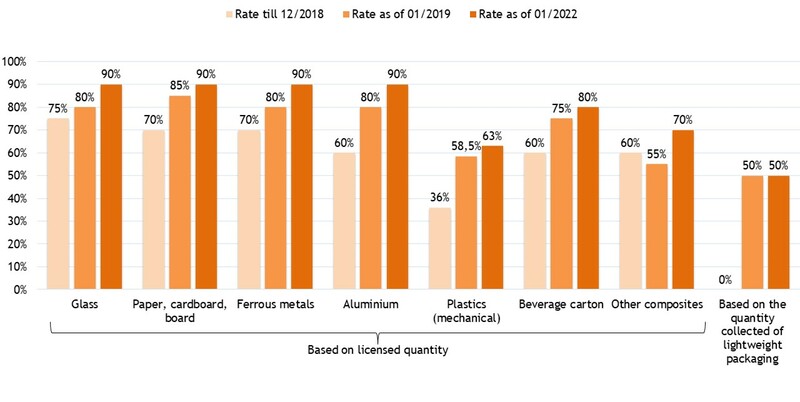 According to § 11 of the Packaging Act, manufacturers and distributors who exceed the quantity thresholds of 80 tons of glass or 50 tons of paper, cardboard and board or 30 tons in total over the material types ferrous metals, aluminium, plastic, beverage carton packagings and composites are obliged to submit the CS until 15 May of the following year to the Central Agency. The Central Agency or the competent regional authority may demand at any time, even if these thresholds are not met, that a Completeness Statement is filed. According to the wording of Section 11 (1) of the Packaging Act, the CS must include "all" sales packaging and repackaging that was first marketed in the previous year. The type and mass of all packaging and repackaging which has been placed on the market for the first time in the previous calendar year. The type and mass of all packaging and repackaging which has been placed on the market for the first time in the previous calendar year but that typically didn’t produce waste at households and equivalent sources of waste generation (e.g. hotels, canteens and hospitals). Information on participation in dual systems with regard to the obliged packaging that was placed on the market in the previous calendar year for the first time. The type and mass of all packaging and repackaging taken back in the previous calendar year via one or more industry solutions in accordance with § 8 Packaging Act. The type and mass of all packaging taken back in the previous calendar year pursuant to § 7 (3) Packaging Act. Information on the fulfilment of the recycling requirements with regard to the sales packaging and repackaging taken back in the previous calendar year pursuant to § 15 (1) Packaging Act. Information on the fulfilment of the recovery requirement with regard to the packaging taken back in the previous calendar year pursuant to § 7 (3) Packaging Act. The CS must be checked and confirmed by a registered expert or by a registered public accountant, tax consultant or certified auditor pursuant to § 27 (2) Packaging Act and submitted in electronic form together with the associated test reports to the Central Agency. The confirmation must be provided with a qualified electronic signature in accordance with § 2 of the Signature Act. The dual systems are obliged to confirm the participating packaging quantities to the manufacturers and distributors involved. Thus, manufacturers and distributors have a claim that the dual system itself confirms their participation, broken down into packaging materials. So there is a claim to the original licensed quantity confirmation of the commissioned dual system. Confirmations from third parties (e.g. brokers) are not a confirmation of licensed quantity within the meaning of § 7 (1) sentence 3. The responsibility under packaging law for an incorrect, incomplete CS or one not delivered in time remains with the manufacturer or distributor, even if he has commissioned or authorized a third party. According to § 20 (1) Packaging Act, the dual systems are also required to provide information on the quantities of packaging licensed to them in relation to the respective companies. The assignment to the CS of the manufacturer or distributor is made via the registration number of the manufacturer. The Central Agency compares the reported quantities of the manufacturer with the reported quantities of the dual system. In addition, manufacturers and dual system reports are compared with each other and algorithms are programmed to detect abnormalities.